This is a follow-up to my unforgivably long very first blog post. I was blown away by the outpouring of support & encouragement I received. The time people took to write thoughtful responses to my post was unbelievable. I was also surprised to discover how much I love it when someone comments on my blog posts. I had no idea! Two months after that blog post (on May 18), I finally did it. 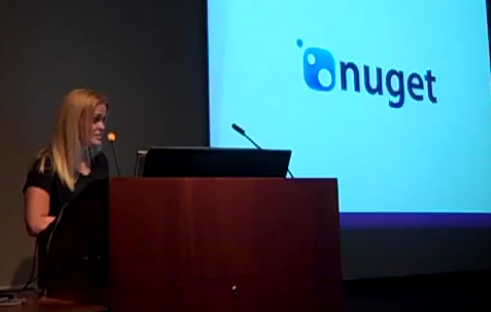 I did a tech talk to a group of about 30 developers at work on NuGet. A surprising thing happened…. It actually went ok! By no means am I saying it was great, or that I’ve found a new calling, but to my surprise, I didn’t die. I didn’t embarrass myself. It didn’t make me want to run home & cry & hide for the rest of my life. What’s exciting about that is, that means both are actually being accepted & used now for some of our projects at work. To me, that makes it all worth it. Preparing a talk is a LOT of work. I seriously can’t believe how much preparation time it takes. If you do tech talks, THANK YOU. It might feel thankless & frustrating & make you wonder why you put yourself through the stress of it, but as one who has grown tremendously, as a result of [wonderful people like] you speaking at tech events, please know you’re helping in ways you might not even know. You’re truly affecting & improving careers & lives (like mine). This is the one I did the most soul-searching on. I no longer think my fear of walking into that first tech event was about gender. Sure, more men are programmers right now. I believe that will change naturally & dramatically in the next few generations because programming is becoming more approachable. I “left society” for a few years to have babies (while working in my new career as a programmer, so I didn’t talk to very many people at work during that time), and when I “came back”, I had no idea who I was. I lost my identity & became very insecure as a result. I now notice a LOT of people who “look different” at meetings. I’m sure it was just as hard for them to walk into that first meeting room full of strangers as it was for me. We all have our differences. We all have our insecurities. My “one of these things is not like the other” instinct made me blame the easy visual (I’m a girl) instead of what I now believe to be the real reason (what I’ve seen referred to as imposter syndrome): Fear I might not be a “real” programmer. Blogging is Great Therapy; Who Knew? I have a tendency to overthink things & to get stuck in my own head. I was SHOCKED at how therapeutic & freeing writing that blog post was. It enabled me to let go of & work through things that had been mentally & emotionally weighing me down. And guess what? I don’t feel like a girl any more at events. I feel like a person. And it’s awesome. Just wanted to drop it and tell you how much I enjoy reading your blog. I read this post first then read the first post that you mentioned. Very interesting perspective on the local .NET community. When are you going to be speaking again? Mr Rayburn had told me on more than one occasion that the jitters get better with practice. After surviving an Improving group lesson that emphasized impromptu speaking, I’m starting to see the truth in Tim’s advice. For instance, standing at the front of the room explaining a design approach for the last Hack Club kata wasn’t nearly as intimidating as speaking in front of groups had been for me previously. I’m not ready to put together a 75 minute talk, but I think like you, I’m getting more comfortable in my skin when all the eyes in the room are pointed in my direction.